Lyric welcomes a brand new tradition to the Plaza Theatre with the classic holiday story of LYRIC’S A CHRISTMAS CAROL, presented by Devon Energy, showing from December 9 through 31. Capture the magic and joy of Christmas as the ghosts of Past, Present and Future lead the miserly Ebenezer Scrooge on a powerful journey of transformation and redemption. Relive the cherished tale of Jacob Marley, Bob Cratchit, Tiny Tim, and a host of unforgettable characters as they touch your heart. This classic production is under the direction of Lyric’s own Artistic Director, Michael Baron. Baron, director of Lyric’s past 2010 productions of THE ROCKY HORROR SHOW and DECEMBER DIVAS as well as Lyric’s 2011 Season shows, ALWAYS…PATSY CLINE, BOEING BOEING, OLIVER! and RAGTIME, feels that LYRIC’S A CHRISTMAS CAROL will be the start of a wonderful tradition for families all over Oklahoma to enjoy and cherish for years to come. Baron has directed over 65 productions at theaters across the country including the current production of A CHRISTMAS CAROL at Ford’s Theatre in Washington D.C. Completing Baron’s artistic staff for LYRIC’S A CHRISTMAS CAROL is Ashley Wells, choreographer; Brian Hamilton, music director; Josh Schmidt, sound designer; Lee Savage, set designer; Courtney Strong, props master; Mark A. Stys, stage manager and Jeffrey Meek, costume designer. A familiar face on Lyric’s stage, Oklahoma City native, Jonathan Beck Reed, will play the unforgettable Ebenezer Scrooge. Reed is an internationally recognized actor, director, designer and instructor with over 35 years of experience working in professional theater. Reed feels that in addition to bringing the holiday spirit to audiences, the show also transforms people. Marking his 28 year with Lyric Theatre, Reed’s Lyric credits include THE WILL ROGERS FOLLIES, GREATER TUNA, MUSIC MAN and the world premiere of COUNTRY CHRISTMAS CAROL at Lyric Theatre in 1996. He has also attained national, and international Broadway touring credits such as 42ND STREET, MY FAIR LADY, ME AND MY GIRL, PETER PAN, LITTLE ME and the critically acclaimed Broadway revival of A FUNNY THING HAPPENED ON THE WAY TO THE FORUM. Joining Reed in the cast of LYRIC’S A CHRISTMAS CAROL is Matthew Alvin Brown, Tommy Cunningham, Mateja Govich, Melissa Griffith, Mandy Jiran, Charlie Monnot, Tom Houston Orr, Jayme Petete, Susan Riley, Brenda Williams and Lexi Windsor. Single tickets for LYRIC’S A CHRISTMAS CAROL, presented by Devon Energy, are available for purchase and are $40. For tickets go to www.LyricTheatreOKC.com, call (405) 524-9312, or come by Lyric’s box office at 1727 NW 16th St, Oklahoma City, OK. Performance times are Tuesday, Wednesday and Thursday at 7:30 p.m., Friday and Saturday at 8:00 p.m. with a 2:00 p.m. matinee on Saturday afternoon. 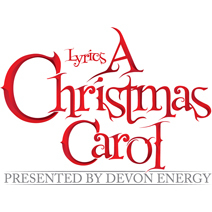 Presenting sponsor for LYRIC’S A CHRISTMAS CAROL is Devon Energy. Additional support is provided by The Oklahoman, O.K. Detrick Foundation and Mark and Beverly Funke. Annual support is provided by Allied Arts, The Inasmuch Foundation, Kirkpatrick Foundation and the Oklahoma Arts Council.